Since their introduction over three decades ago, dental implants have evolved into dentistry’s premier tooth replacement choice. While their primary purpose is to replace missing teeth and rejuvenate a patient’s smile, they’re also regarded for another important benefit: they can slow or stop bone loss accelerated by the loss of teeth. Like all living tissue, bone has a life cycle. Older bone dissolves and is absorbed by the body, a process called resorption. New bone forms and grows to replace the resorbed bone in response to stimuli occurring within the body. In the jaw, this stimulation comes from the forces the teeth receive when we bite or chew. When a tooth is lost, however, it no longer transmits these force stimuli to the adjacent bone. This results over time in less new growth to replace resorbed bone, and the overall bone mass shrinks. In fact, about a quarter of the normal bone width will diminish in the first year alone after tooth loss. Other serious problems follow, like gum recession or chewing and speaking difficulties. A person’s appearance may also suffer, because as resorption continues unchecked, the underlying foundational bone will continue to shrink. As more teeth are lost, a decrease in the distance between the nose and chin may result causing the lower third of the face to become smaller in size. Dental implants can interrupt this process by encouraging bone growth around the implant. 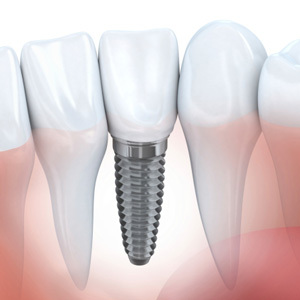 Implants are made of “osseophilic” titanium, meaning the metal has a natural affinity with bone. After implantation, bone cells will begin to grow and attach to the titanium post. The enhanced growth stabilizes bone loss by providing stimulation to the bone as teeth once did, thereby maintaining bone levels and minimizing potential effects on the patient’s appearance. Ironically, too much bone loss could make the installation of implants more difficult, since they require a minimum level of bone mass for anchorage. Receiving an implant as soon as is practical once a tooth is lost will minimize the chances of that occurring — and a better chance of improving bone health overall. Should I Consider Cosmetic Dentistry?